Remember ‘Tom the Cheap’, a supermarket chain that first appeared in Adelaide about the 60s & 70s. According to Wikipedia it was started by Tom Wardle from WA and was probably the introduction of aisle type shopping in Australia. Previous to that groceries were served from behind a counter. Tom’s offered a no-frills service with just a 10% markup as opposed to the standard 25% from his competitors. He started out with just one shop, a corner-store grocery, in 1946 in rented premises in Fitzgerald Street, North Perth steadily building the business and good will. He managed to purchase the property in 1952 and while holidaying in Sweden with his wife in 1955, Tom observed developments in northern European supermarket retailing, which was a move away from shop-counter service to a system which allowed shoppers to browse aisles of produce at their own leisure. He also saw greater competition between retailers, unlike the resale price maintenance regime which seemed to exist in Australia. In early 1956 he sold the Fitzgerald Street shop and rented larger premises, fitting it out himself with a self-service supermarket layout. He soon opened under a red on white sign displaying “Tom the Cheap”. His business model was essentially discounted trading margins and a no-frills service. Old and new customers soon flocked to the store, attracted by his shop-wide discounts which undercut his opposition. By the early 1960s business was booming and Tom opened four stores in South Australia. He usually favoured old picture theatres which offered plenty of room and were cheap and quick to fit out. By June 1965 he had 90 Western Australian stores, 24 in South Australia, 14 in Melbourne and 2 in Sydney. Total annual turnover exceeded £14.5 million and net profit in Western Australia alone was more than £325,000 per annum. Expansion continued and by 1971 he had a 208 store-strong retail empire around the nation. In 1972 Wardle acquired a 55% share in a property investment company to finance property purchases and in early 1977 defaulted, triggering a financial collapse of the Tom the Cheap family companies. Receivers were appointed and by mid-1978 a dividend of five cents in the dollar was declared on debts which had by then ballooned to more than $9 million. Tom Wardle was forced to walk away from the business and with his wife and died something of a recluse in 1997 and Lady Wardle died in 2005. Tom the Cheap is just a memory now. This is the one on Goodwood Road (which I think is now a chemist shop). Photo thanks to ‘The Scooter Guys Favorites’ on Flickr Photoshare. I worked for them when I was 16. As a child my brother, sister and myself regularly went to the “pictures” matinee on Saturday afternoons at the Col. Light Gardens theatre on Goodwood Road, which later changed to a ten pin bowling alley, then to the Tom the Cheap supermarket which was featured in your blog. Later, in my working life, I prepared the advertisements for Tom the Cheap for the local Messenger, dealing with the receivers at the time. Reason I googled tom the cheap is because we are about to give to charity a set of saucepans bought in Tom the cheap in perth in 1967 ! They are aluminium with coppered lids,still in perfect order ,no loose handles or knobs.I think we got good value for money.!! Heh, I remember the old Tom the Cheap in Glenelg. The Checkered floors that were so old the tiles were coming up. I remember buying as a kid around the late 1970’s when my great aunts boyfriend got stuck with looking after me and so took me around to do the rounds of bill paying and shopping. I remember buying some dust old fly paper spirals you’d hang from the ceiling that more often than not got stuck in someones hair. He used to buy from that store(Glenelg) Big Red tomato soup that came out of the can in one solid can shaped formation and took a while for it to ;’melt’ in the saucepan before having to add one can of water or half water and half milk. I wonder if anyone knows when the Tom the Cheap store closed in Glenelg? Everyone remember the advert jingle for it on TV? Tom the cheap, bom,bom,bom! Which I think has been appropriated by Cheap as Chips with the sound of the ad music they’ve used for their ad. Does anyone remember the names of cheap discount stores that littered the suburbs with the names of ‘Half Case’ where the products was wheeled in on a slab and they just cut the boxes open? 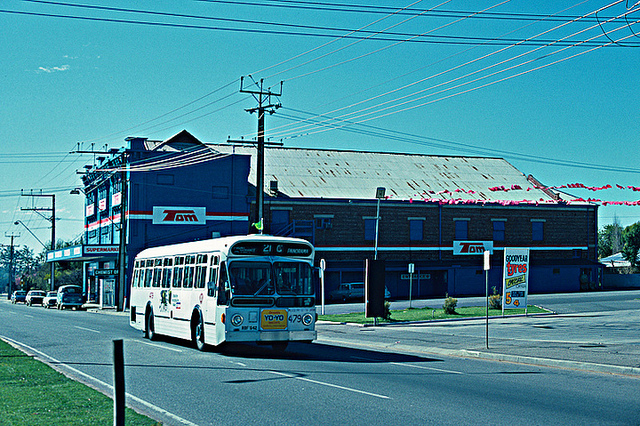 I remember a Tom The Cheap on Lower-North-East Road in the Campbelltown area just up the road from the Glynde corner. Just last year my mother showed me a hand-written recipe by my Oma ( paternal grandmother ) , placed on the back of an old ‘opening-day’ ad/flier for that very same Tom The Cheap store! If my memory serves me correctly, in the early 1970’s the sign on the front of the store included a cartoon like character in stripped clothing with a mask ( think cartoon burglar ). RJ Pickford: I never liked the tomato soups back then. They were too tinny for my taste, regardless whether mum had used water or milk to reconstitute them! I tell everyone about tom the cheap all the time. I always say that back in those days there was egg cream shampoo or no tears shampoo. Not like now there is twenty shampoos and conditioners. I went to the one at Kurralta park South Australia. We used to load our groceries into a card board box. And bring the same box back each time. No plastic bags. I remember a Prosh Week stunt by Adelaide Uni students involving Tom the Cheap. The Anglican bishop of Adelaide at the time was Tom Reed. Students stole the Tom the Cheap sign from the front of the Nth Adelaide supermarket and using some steeplejacking skills suspended it between the two spires of St Peters cathedral. I remember the Tom’s in Forbes on Marion rd. Nanna was always just popping down to Toms for cigs, bread, milk or something. I was very little but I still noticed they hired pretty young girls to work behind the counter. Was there a store in parafield gardens?